Hello and thank you for us here at the Hampton Art blog today! 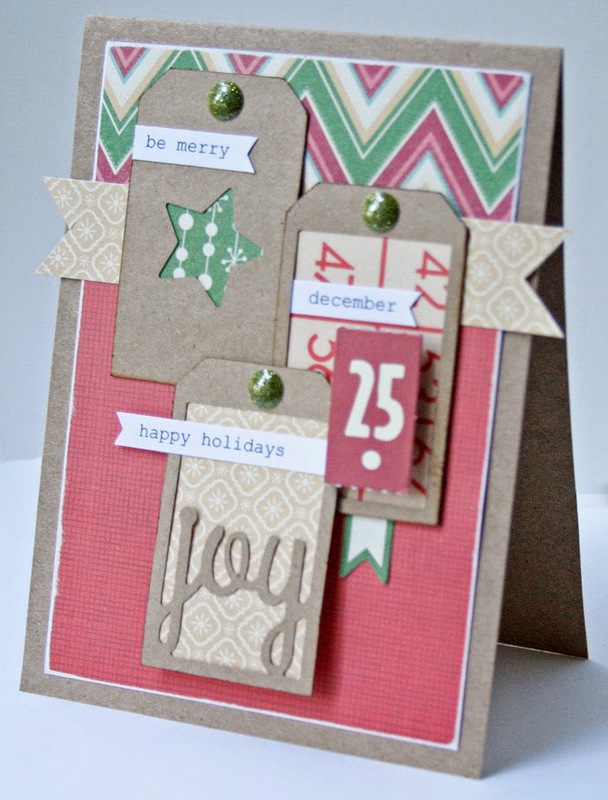 Make card base for a 4.25” x 5.5” card from green cardstock. 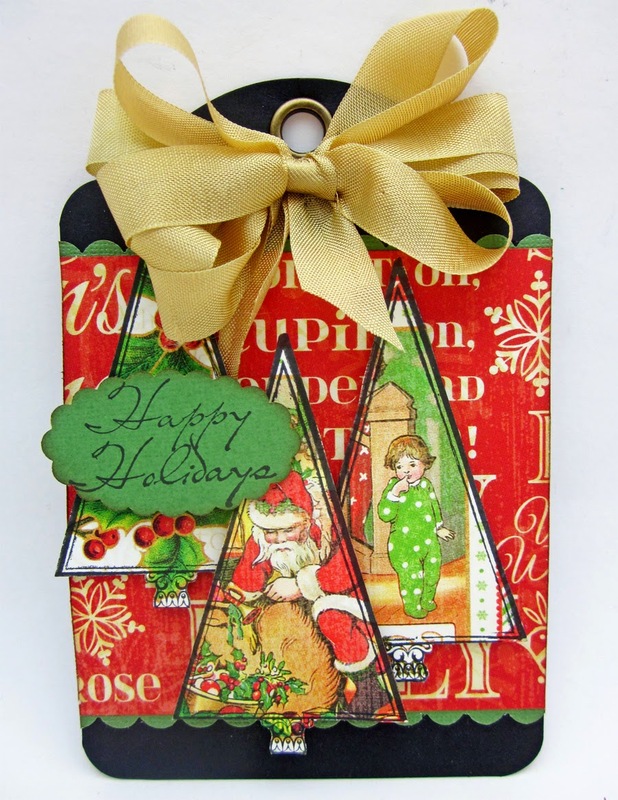 Die cut 4.25" x 5.5" panel from patterned paper with stitched frame die and adhere to card. Die cut stitched circle from ephemera card and adhere. Adhere cork and vellum butterflies; draw antennae. Cut and rearrange pearl swag; adhere when satisfied. Looking for the perfect accents for your winter photos? This brand new stamp & die set from Hampton Art was just what I needed to highlight a sledding photo from our marathon winter last year. Paired up with some cool shades of Soup Staples III and a super fun stencil by Jillibean Soup and it becomes a real keeper. Crazy cute snowflake stamps and die set, I could not resist them. As you can see they made great accents for this winter layout of my son’s first real sledding adventure. 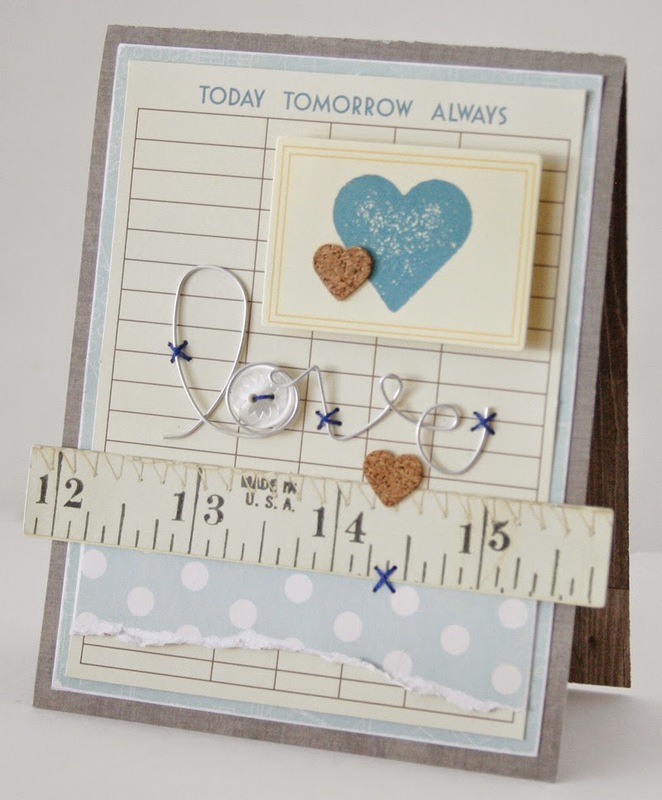 This layout began with a sketch by Scrapbook Generations, it is a wonderful way to speed up the creative process. I selected some Soup Staples III papers and got to work. Following the sketch I cut out the border strips, banner pieces and blocks. Then I added some stitching for extra texture. 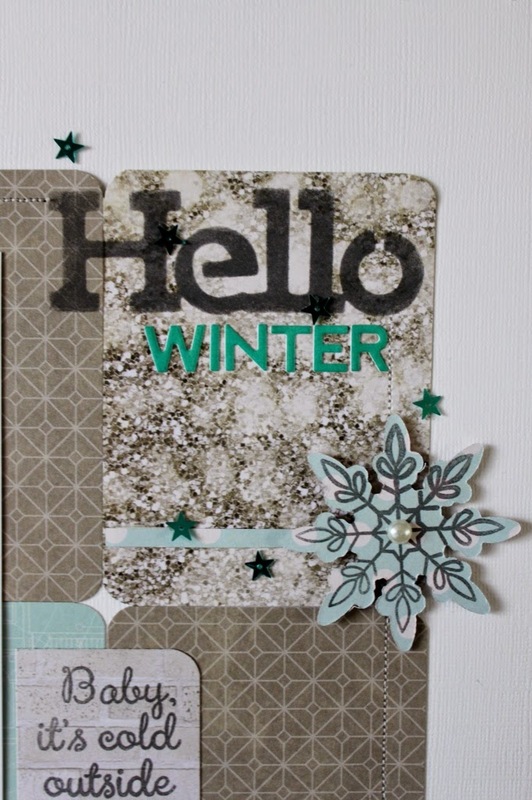 Then I had some fun with the title, using a mix the media “hello” stencil with charcoal gray ink and some teal alphabeans. 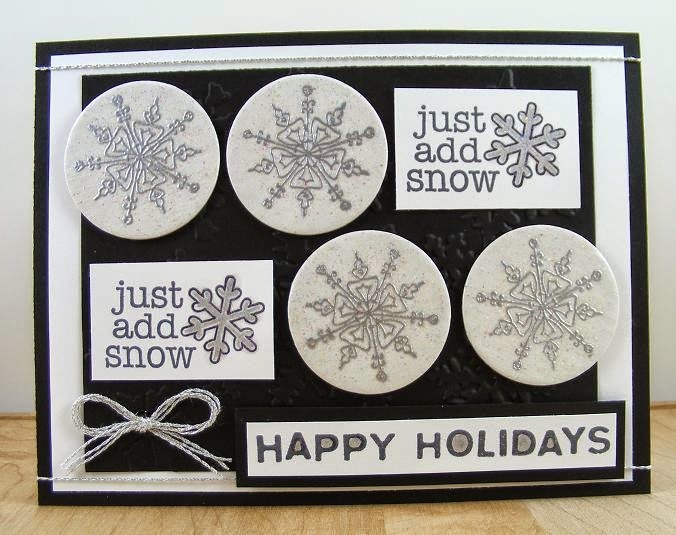 Next I stamped the five snowflakes onto patterned paper with gray ink from the Soup Staples III collection and then loaded them into my Cuttlebug and using the die cut them each out. 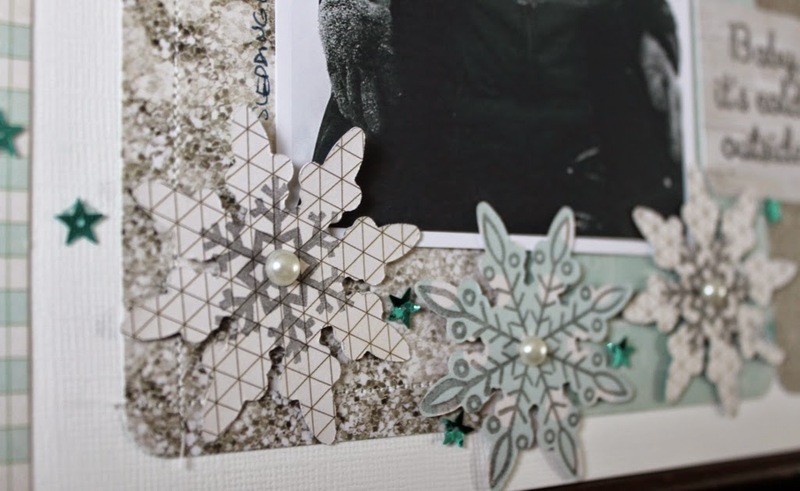 Next I added them to the page with 3D foam dots and embellished them with white pearl centers. 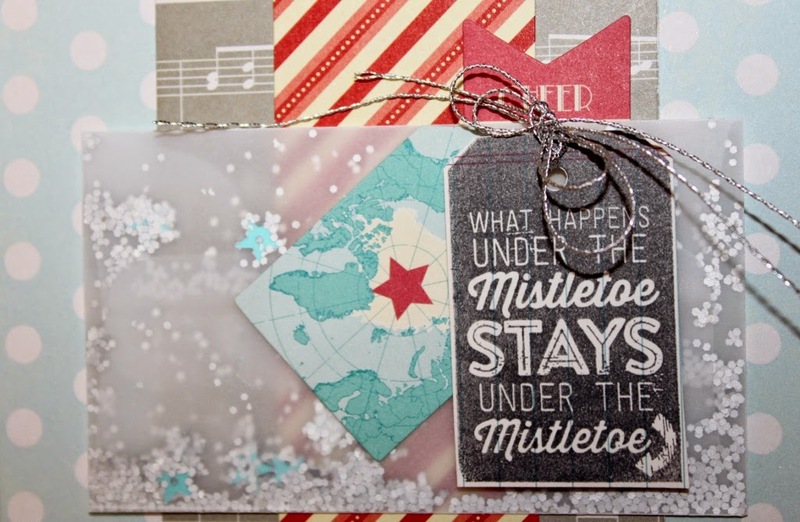 I then stamped the subtitle “Baby it’s cold outside” onto brick patterned paper in gray ink as well. Last I added some sparkle with the brand new Jillibean Soup Star Sequins in blue and sprinkled them around the page as shown. 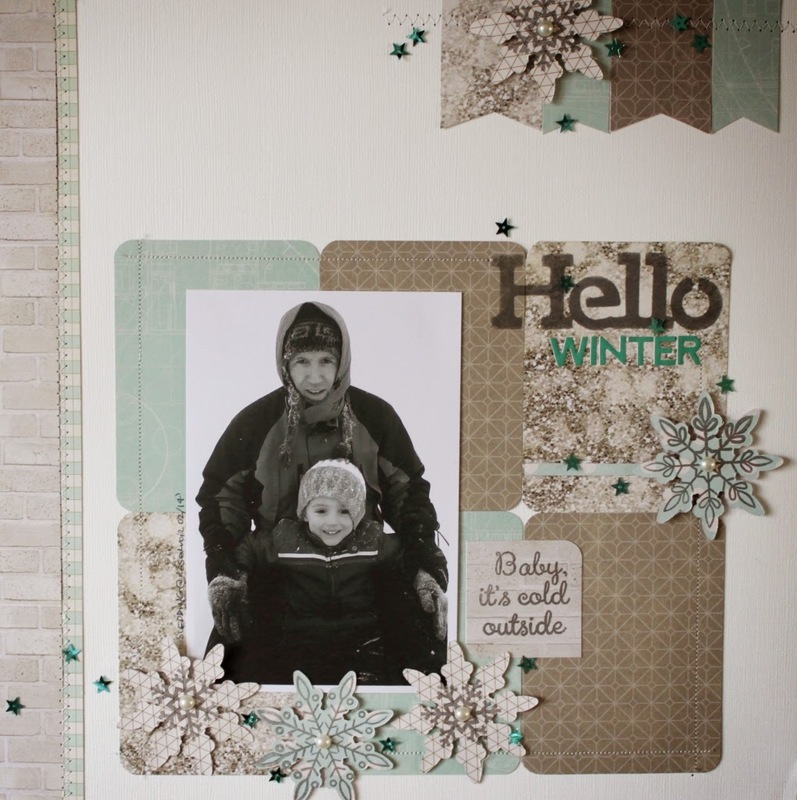 You can create this layout and step into your own Winter Wonderland too. Good morning! When I saw all the new Jillibean Soup products I instantly fell in love with the fun wire words! I know the words can be adhered with a little glue or some clear adhesive, but I thought it might be fun to get out a needle & thread and sew them instead. 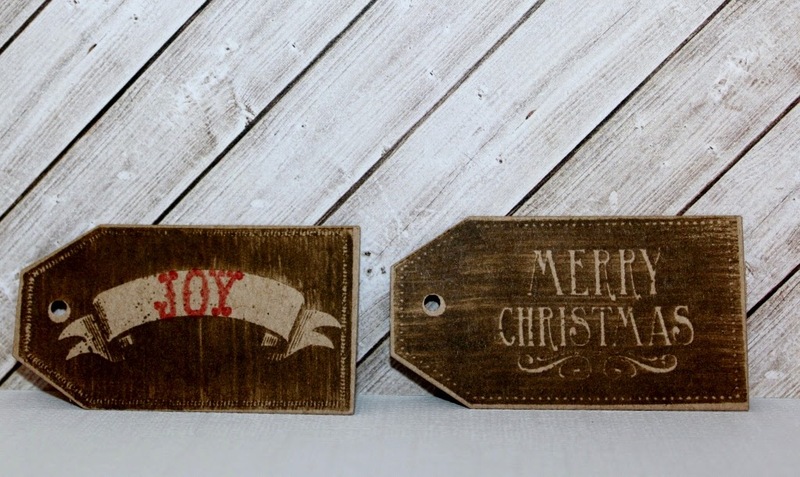 I used the “love” and “hello” to make a couple of fun greeting cards and then the “joy” for a Christmas card. I love the way the stitching on the words looks on the cards! Thanks for looking and thanks for stopping by the blog today! 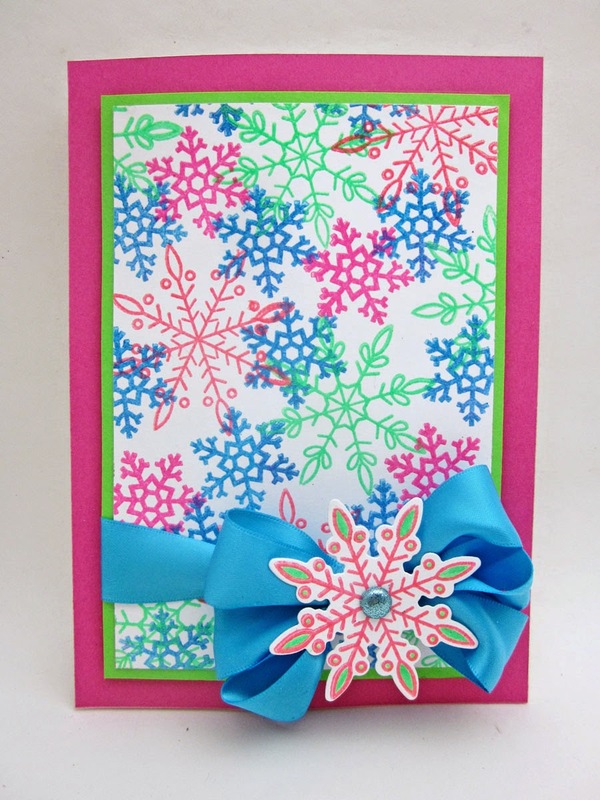 The background was random stamped with snowflakes stamps and in various neon colors. Since the ink I used was pigment ink I coated with embossing powder and set the color. This also helped to give a nice glossy finish to each of the snowflakes. This was so simple but it makes for a wonderful one of a kind background for a card. I love the way this stamp set has a coordinating die set which is how I cut out the perfect snowflake that tops off the ribbon. Stamp snowflakes from Hot Fudge Studio clear set SCO662. 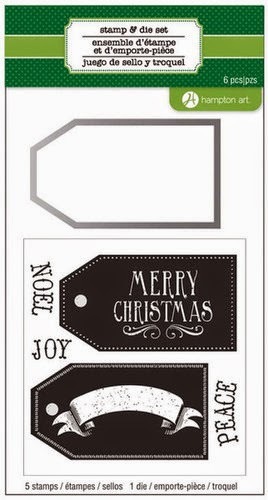 Stamp tags from Hot Fudge Studio clear set SCO668 and die cut; punch holes in centers and adhere to card with dimensional tape. Thread twine through tags and tie into bow. Color gems with Copic marker and adhere to card. We have some wonderful family traditions around the holidays and making a gingerbread house and decorating Christmas cookies is one of those special days we look forward to every year at my parent’s house. This layout using the new Jillibean Soup-Holly Berry Borscht collection captures our holiday tradition perfectly. I just couldn’t decide on one of the new stamp tags so I picked four of my favs. Then I stamped them in charcoal gray onto white cardstock. Next I began to build the layout with papers from the Holly Berry Borscht collection staggered with the two photos as shown. I also have been dying to try the new Mix the Media stencils, so I added the “happy” one into my title using a cats eye ink in green. I really love the added effect of the stencil to the title. The rest of the title was created with a wise word sticker and green alphabean stickers. Then I wanted to add some stitched texture, so with the sewing machine I stitched along several borders as shown. Then the tags were cut out, given ribbon tabs and added with 3D pop up dots. Last several wood embellishments were added, stars and snowflake. Another ribbon was added under the title block. 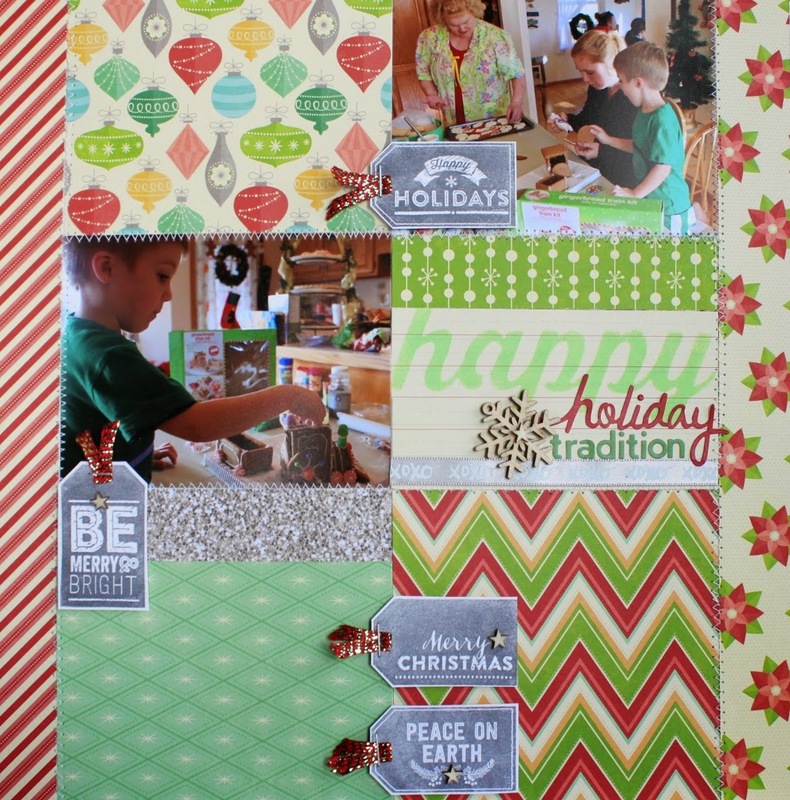 Capture one of your favorite holiday traditions with this layout, the grid pattern makes it quick and easy. Do you have a favorite holiday tradition? We would love to hear about it, please comment below. Welcome back, my Stampin' Sistahs! 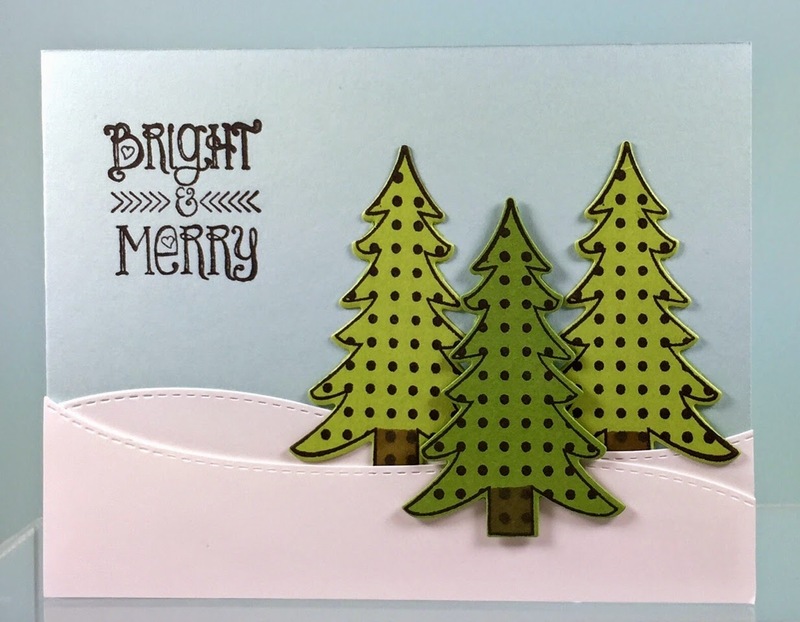 Today's card features the Holly Berry Borscht 6x6 patterned paper by Jillibean Soup and the tree die from a Hot Fudge Studio clear stamp set, both by Hampton Art! 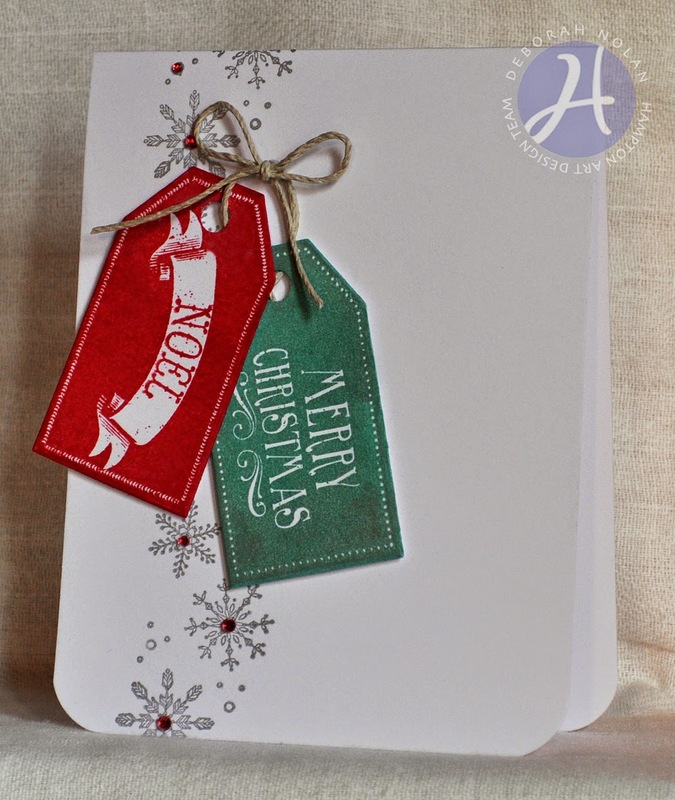 Make card base for a 4” x 5” card from white cardstock. Cut and adhere maroon mat to card front. Cut three strips of 1.25" x 6" calender patterned paper, a 4" x 6" panel of copy paper, and a 4" x 6" panel of vellum. Adhere the three patterned paper strips to the copy paper, aligning the first one to the bottom left corner of the copy paper. Align the vellum to the bottom left corner of the panel and adhere with a smidge of glue in a spot that will be covered. Trim the copy paper and vellum overhang from the panel (the finished width will be 3.75"). Trim top of panel for 4.75" height and adhere to maroon mat. 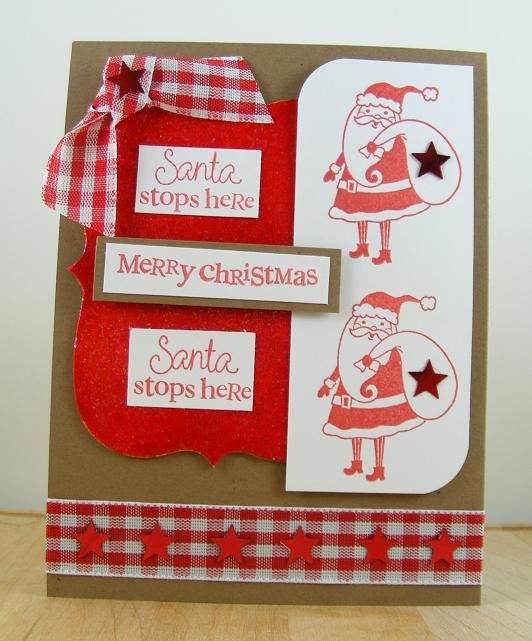 Die cut Christmas tree and sequins and adhere to card; follow with application of Stickles to sequins. 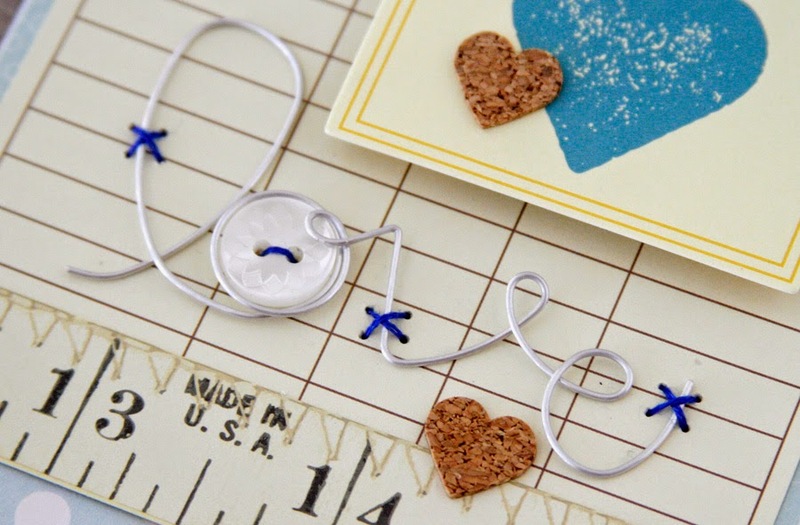 Once dry, adhere gems to sequin centers, tie cord into a bow, and adhere. To anchor vellum, gently lift its corners and apply small drops of glue to areas that will be covered (the tree, sequins and sticker). I think it's beginning to look a lot like Christmas around ye olde Hampton Art blog! Today's card features more of the latest Christmas products from Hampton Art, with a special nod to Jillibean Soup! Stamp sentiment on 4" x 5.25" patterned paper panel and color with pencils and Wink of Stella pens. 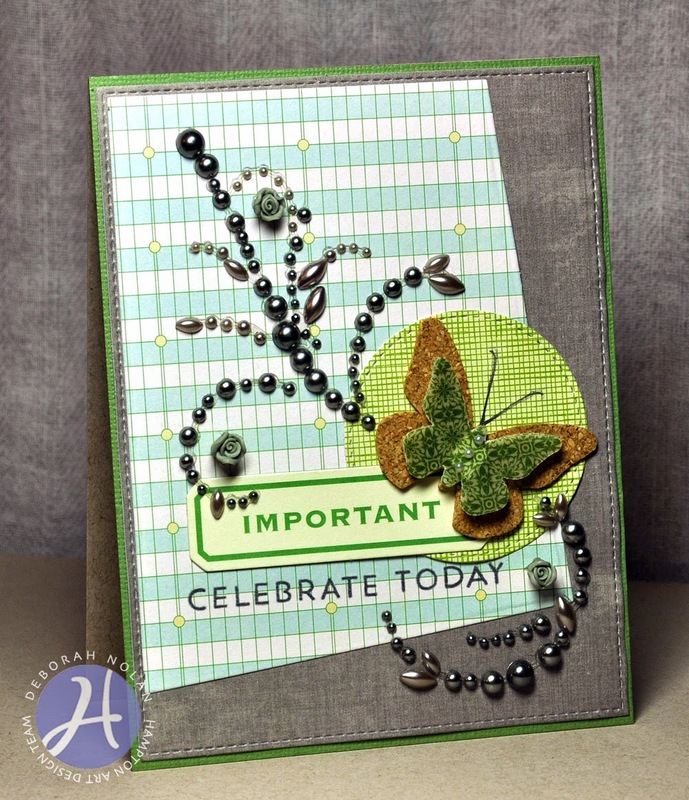 Die-cut green panel and mat sentiment panel; adhere to card. Randomly highlight stamped image with clear Wink of Stella. 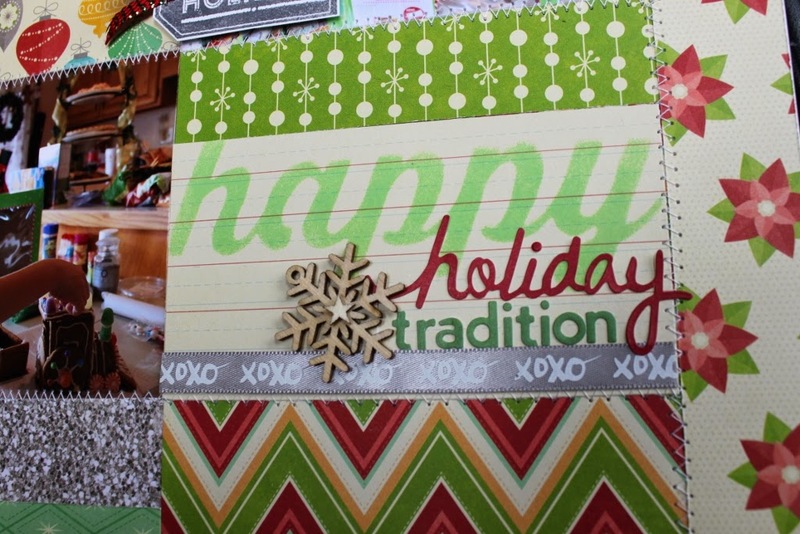 Today I'm sharing two fun holiday cards featuring Hampton Art / Hot Fudge Studio stamps & a super simple one layer card. Just stamp and color! 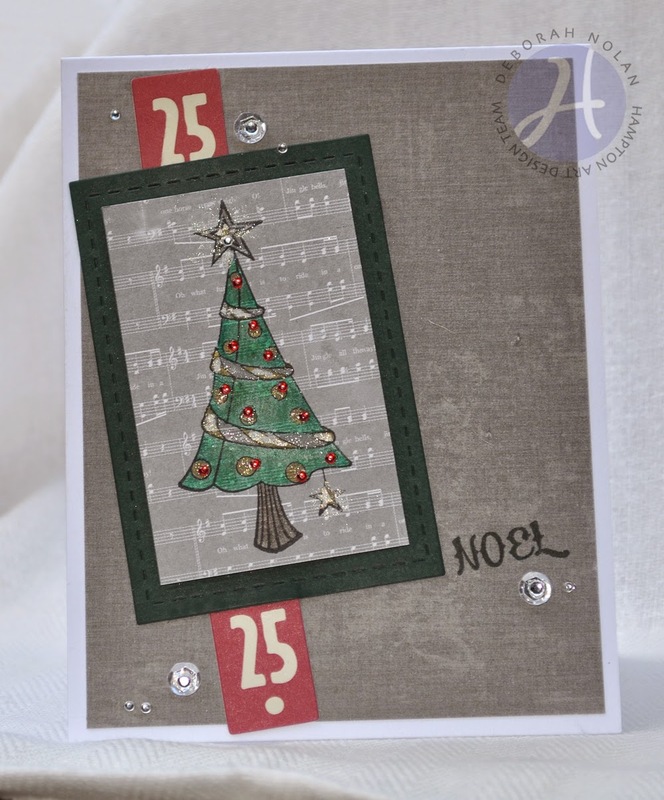 The 2nd cards features a traditional Christmas Tree. One layer cards are easy to duplicate. They also make mailing a breeze since there are no bulky embellishments! Thanks for joining us on the Hampton Art blog! 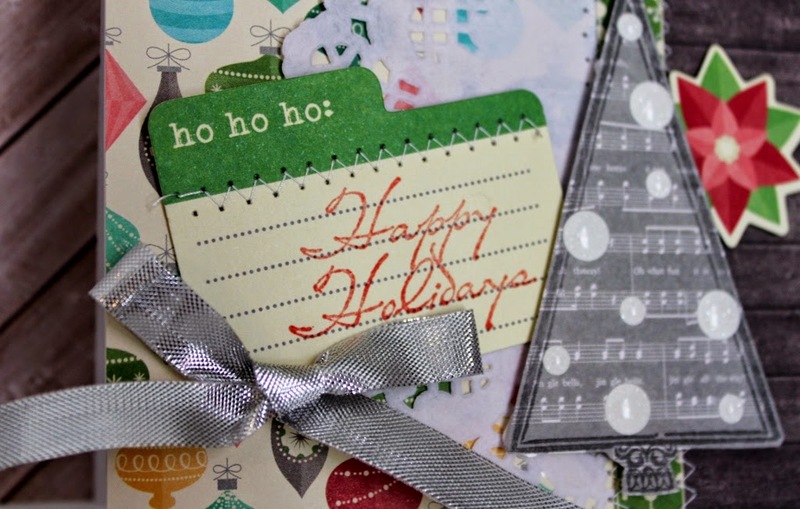 Today I'm sharing two whimsical snowman cards featuring Hampton Art / Hot Fudge Studio stamps. 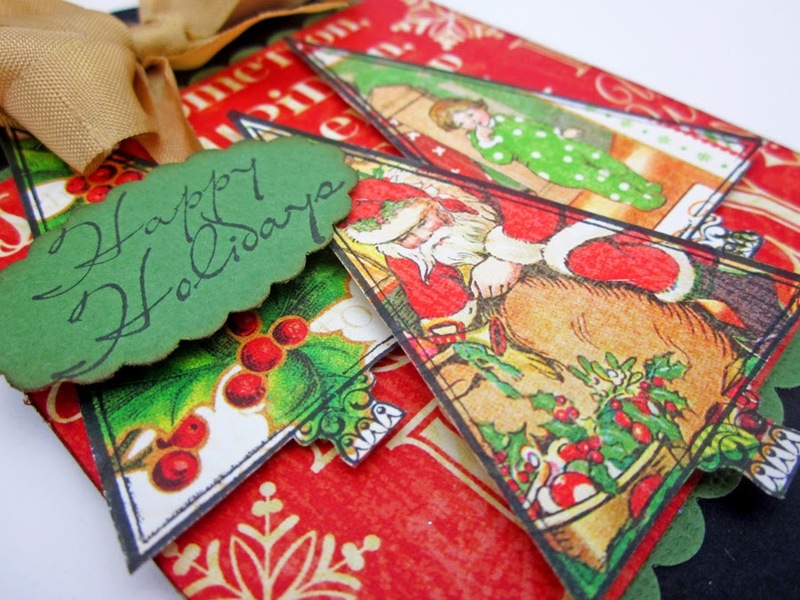 It is time to work on your Christmas cards! I’ve got a few to share with you today that might help to jumpstart your creativity. I used kraft cardstock as the base of each of these cards. 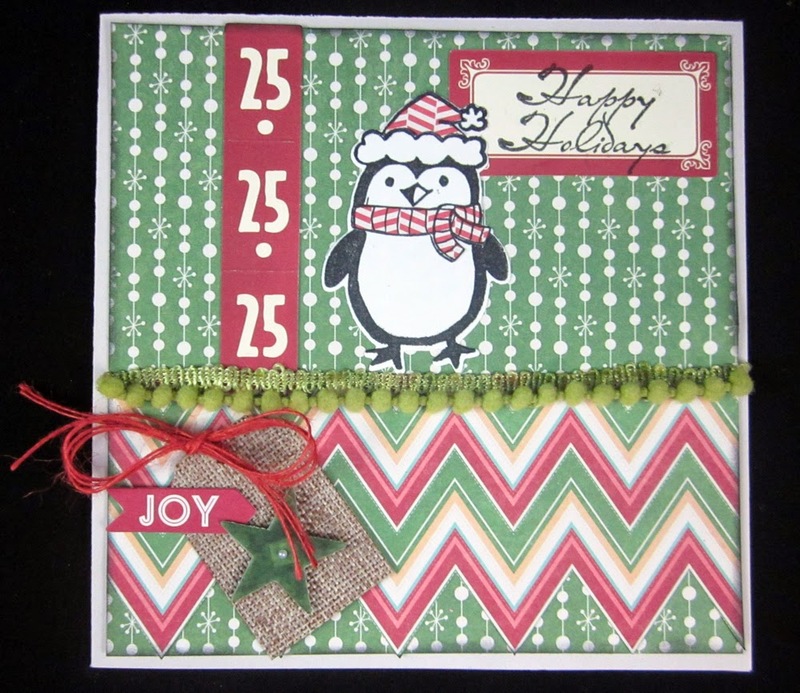 All the patterned paper is from the Jillibean Soup Holly Berry Borscht 6x6 paper pad. Then I decorated them with pieces from packs of ephemera, label stickers, and cork embellishments from Jillibean Soup. I also added a little sparkle with Glitter Dots from KI Memories. Sweet and simple! 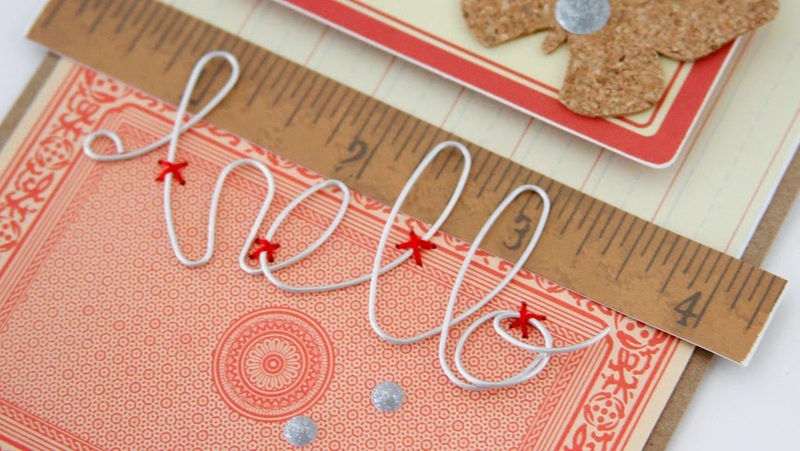 Thanks for stopping by the blog today and Merry (early) Christmas! One of the things I love most about the new Holly Berry Borscht collection from Jillibean Soup is the color combo possibilities. 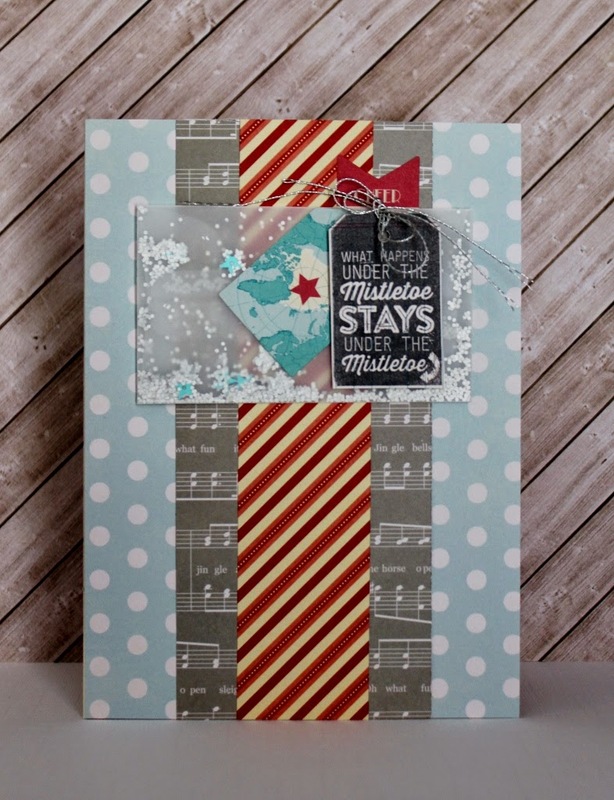 This card uses cool tones the new stamp set, vellum and the fabulous glitter pack. The base of the card is a lovely new polka dot in the softest shade of blue, Read Me paper, from the Soup Staples III collection. Then I layered the Holly Berry Borscht- Smidge of Snowflakes first then a strip of 1 Cup of Holly Berries in the center. 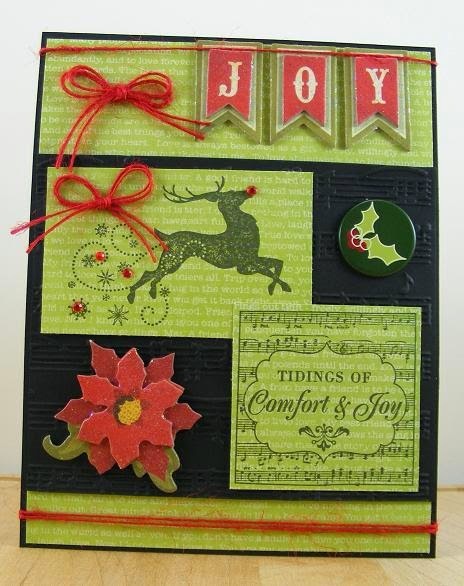 Next I stamped the new Holly Berry Borscht “Mistletoe” stamp onto white cardstock cut out and set aside. Now it was time to grab the brand new Glitter & Sequin Pack from the same collection, I sprinkled some blue stars and silver glitter into a vellum envelope to add some playful interaction to the card. Then I found the north pole sticker tag and layered it under the stamped tag which I added with 3D foam dots and with a silver twine bow. Last I added the “Cheer” arrow sticker also from the coordinating sticker sheet from the Holly Berry Borscht collection. 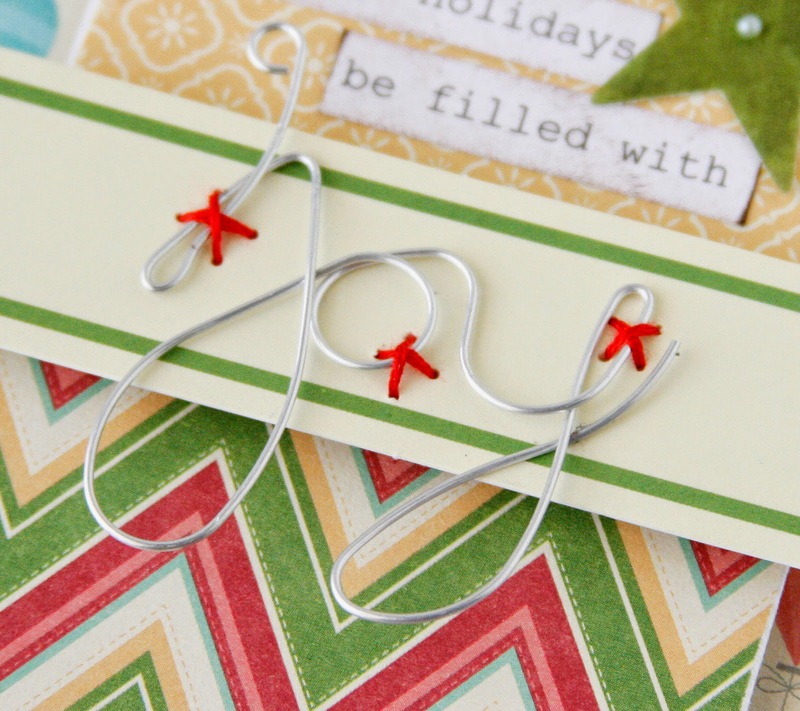 Does someone special in your life need a mistletoe hint? Then this is the card for you! Penquins have a way of just making people smile - so of course I was thrilled to see this new addition to the Hampton Art family. Pair him up with some of the new goodies from jillibean soup, and you are set for some fun! Step 1. Mount patterened paper panel slightly smaller than card to the front of a 6" card base. Step 2. 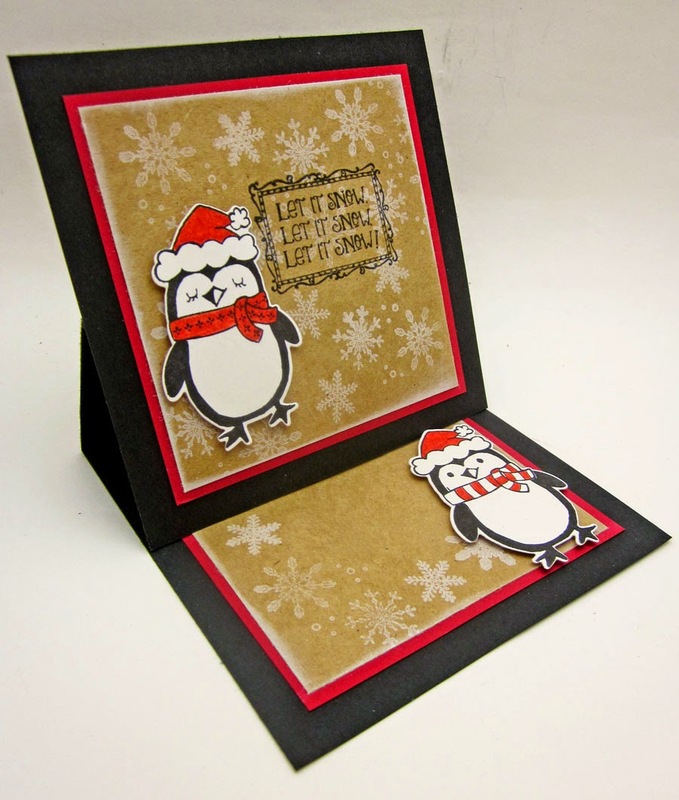 Stamp the Penguin and cut with matching die. Stamp again on patterned paper, and cut the hat and scarf to paper piece. Step 3. 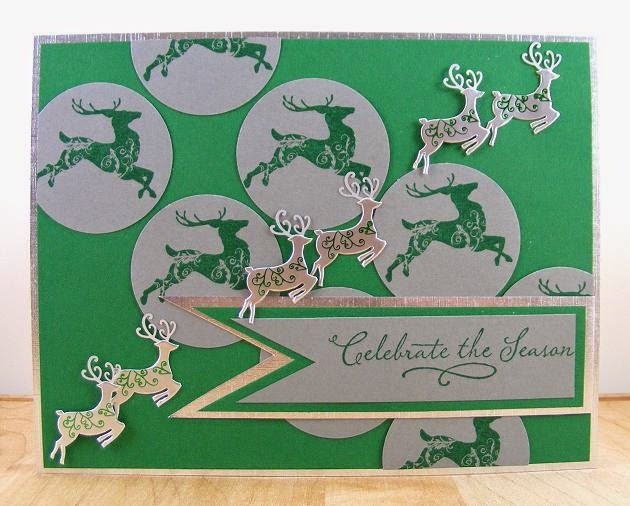 Hand cut the zig-zag paper to fit on card as shown. Step 4. Stamp sentiment on label from ephemera pack. Step 5. 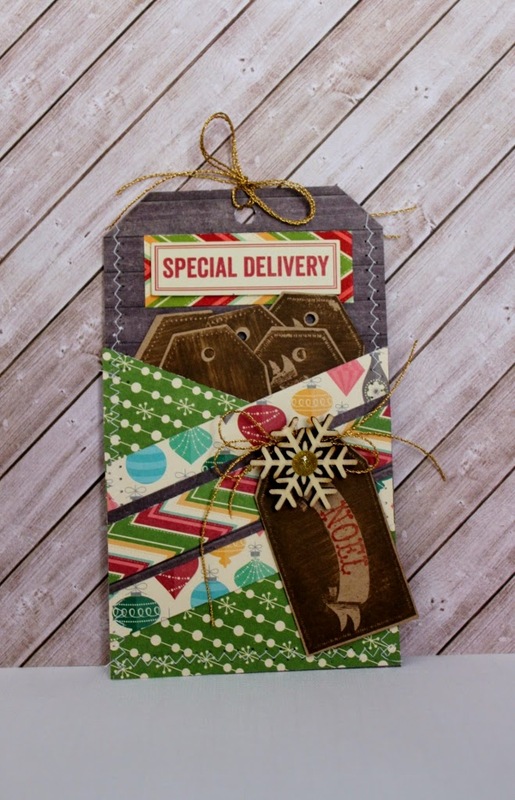 Add vellum star to burlap tag from the ephemera pack. Step 6. 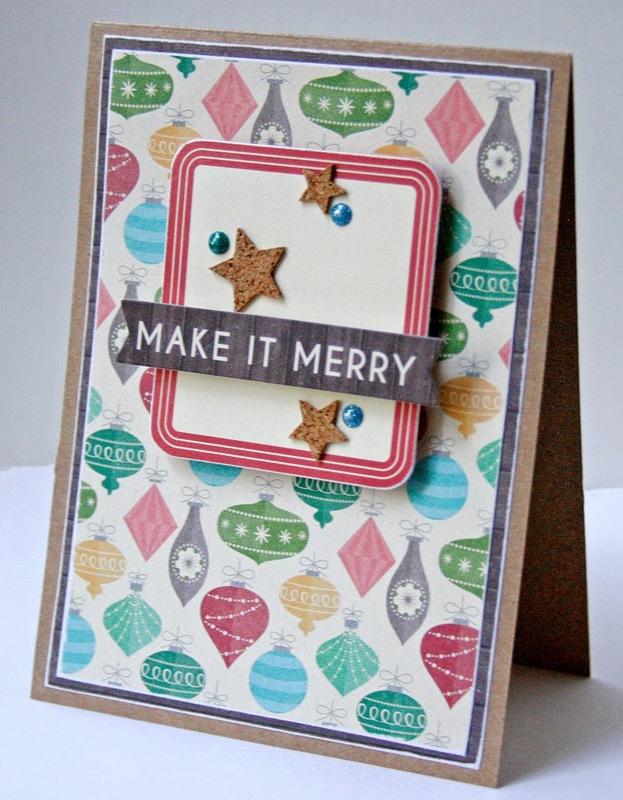 Use the embellishments from the ephemera pack and labels to finish card as shown. 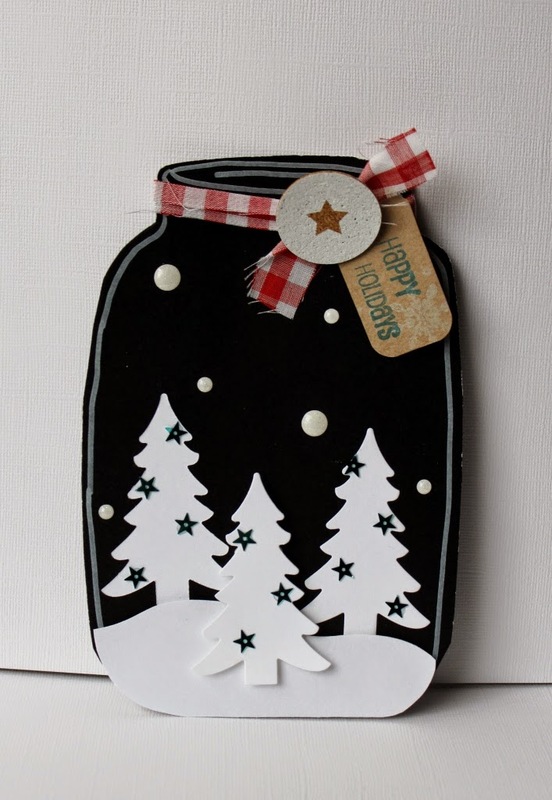 This card was inspired by the ongoing trend of mason jars and chalkboard products. I also wanted to utilize one of the new Stamp and Die sets from Hampton Art in a unique way. First cut out the mason jar shape from chalkboard paper, then outline the design as shown in chalkboard marker. Then the tag was where I began and stamped the snowflake design first then added the sentiment from the stamp& die set in teal blue ink and aqua ink. Then I cut some vintage gingham fabric to make the jar bow and tied it around the lid. The new You + Me printed cork set from Jillibean Soup was a perfect accent for the bow. After that I cut out a white snow drift from white cardstock and added to bottom. Then using the die from the set I cut out three trees from the white cardstock. I added the trees with 3D pop up dots as shown. Then the trees needed some sparkle so I added the new star sequins with liquid glue from the Jillibean Soup/Glitter & Sequin Set from Holly Berry Borscht collection. Last I had to make it snow in my jar, so I added the KI Memories Glitter dots in white. Perfect topper for a Christmas gift is what I am thinking. What are you thinking? Did this project inspire you? I would love to hear about it, feel free to comment below. 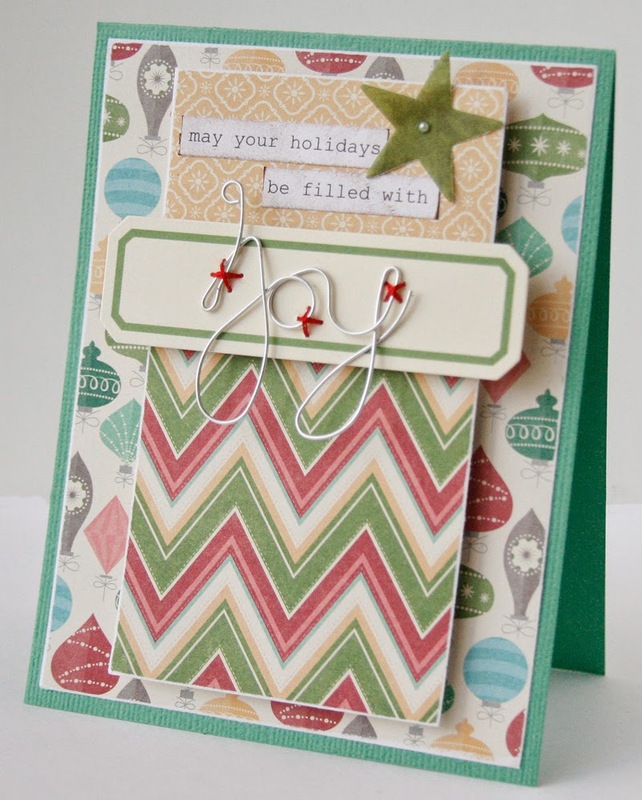 Occasionally I enjoy playing with non-traditional colors for Holidays, this card does that with a Christmas card. The KI Memories/Playlist collection is most likely not usually used for a Holiday card, but why not? 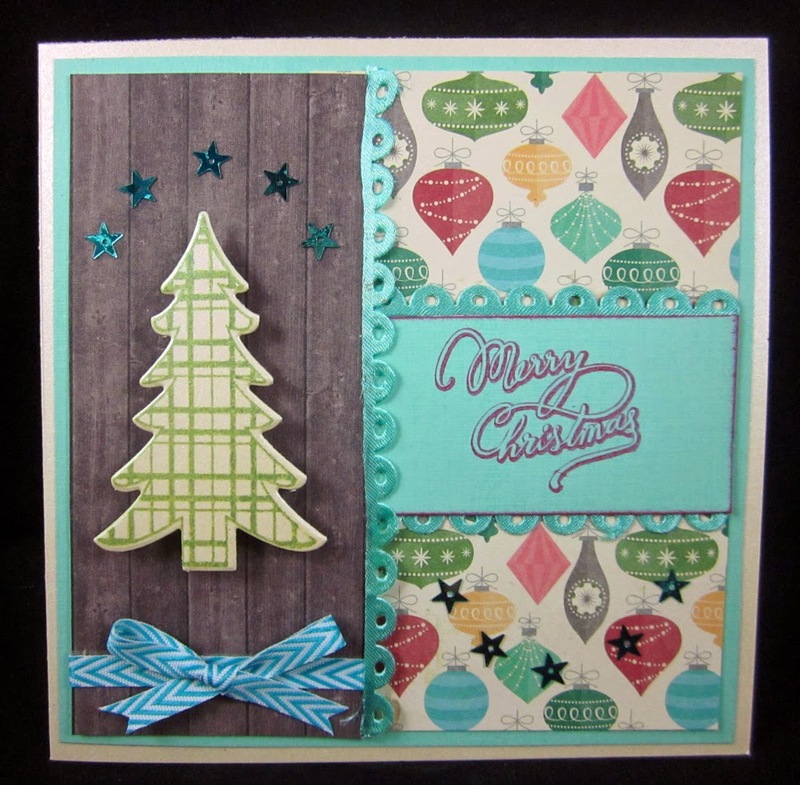 As you can see when paired up with a brand new Stamp & Die set from Hampton Art it really came to life. 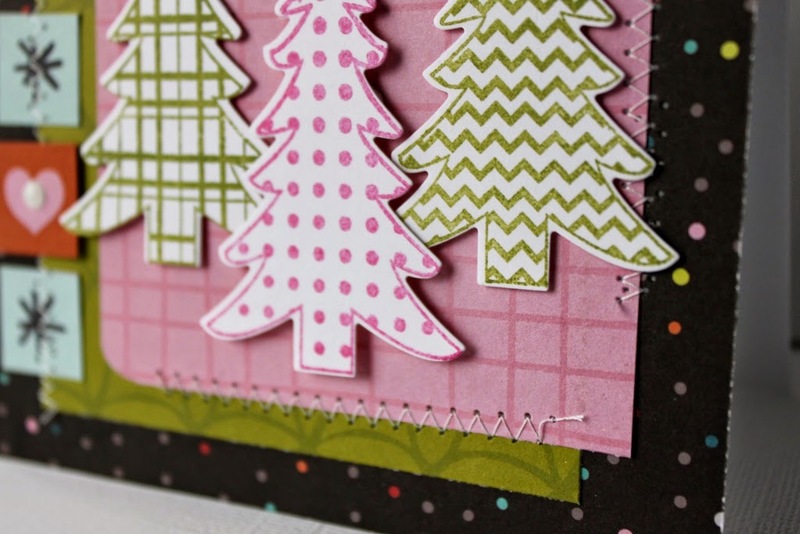 Using white cardstock I stamped the three different tree designs in green and pink ink as shown. Then I cut them out using the matching die from the set. The card base was cut from KI Memories Playlist collection- Volume, then I layered on two mats in Cover Art and Rhythm. Then I cut out the icon squares from the Cover Art paper and added with adhesive as shown. Next I stamped in black ink the Sentiment onto a tab from Audience paper. Then I grabbed the sewing machine and added some stitching for a texture boost. Then all that was left was to add the happy little forest using 3D pop up dots. Voila! 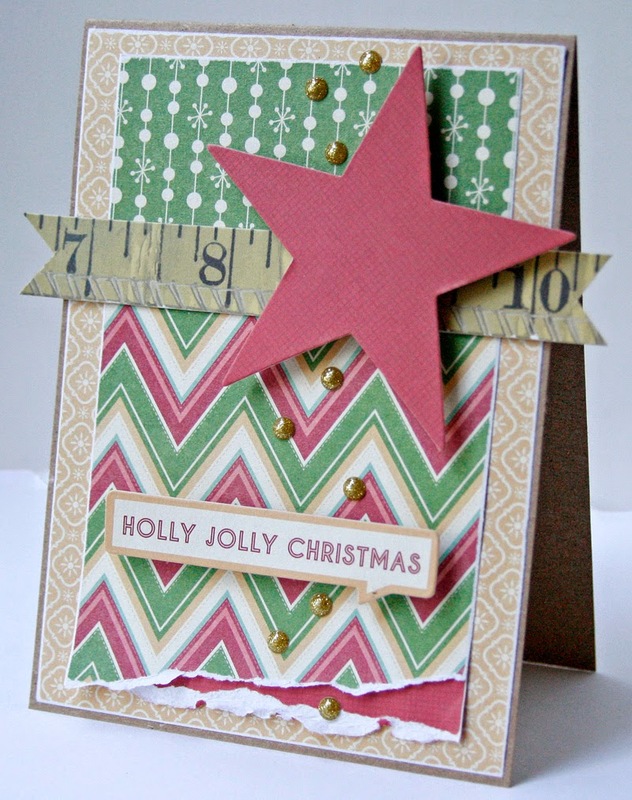 There it is, a fun handmade Holiday card in a non-traditional pink, green and black color combo. 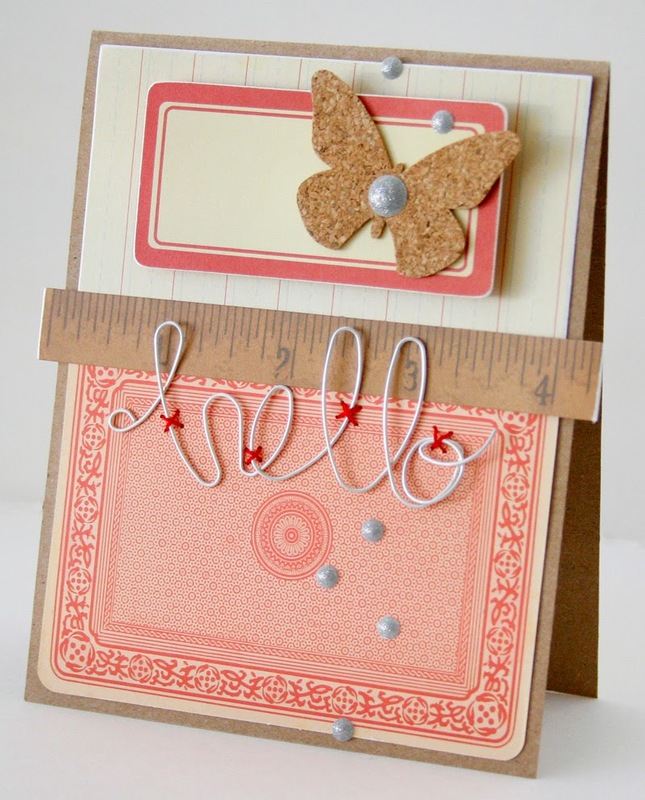 You have to check out all the new stamp and die sets, so easy and so much fun. I love retro colors - especially at Christmas time. So the Holly Berry Borscht line from Jillibean Soup, is perfect! 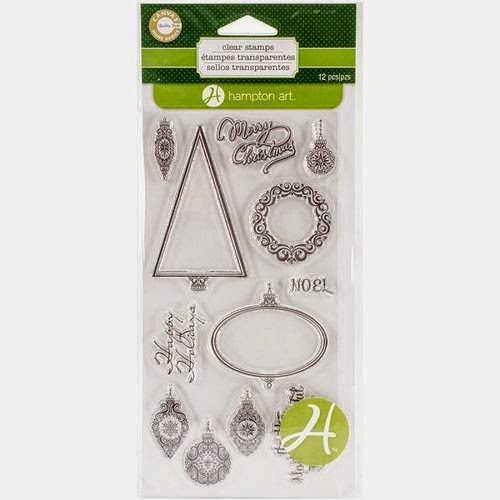 And to make your Christmas card crunch go even smoother, Hampton Art has introduced some adorable stamps with matching dies- a real time saver! Step 1. Mount blue panel slightly smaller than card to the front of a 5 1/2" card base. Step 2. 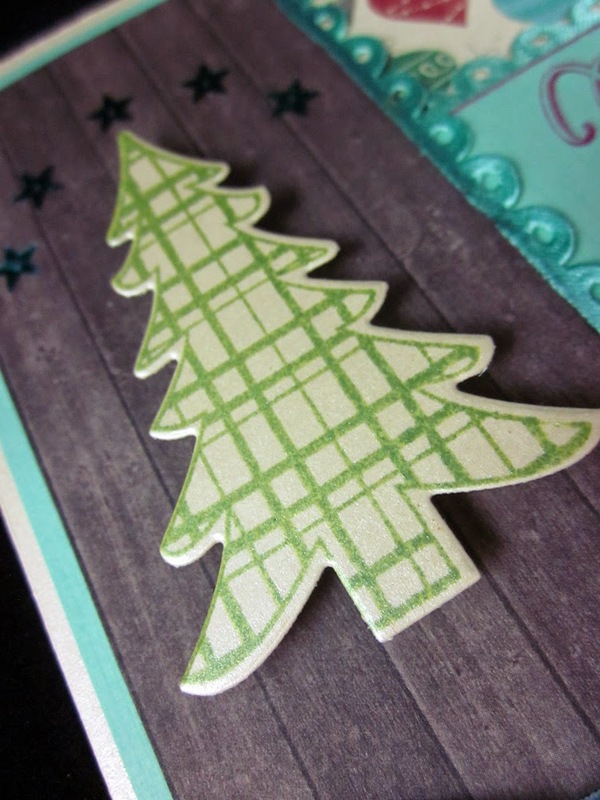 Stamp the Christmas Tree and cut with matching die. Step 3. Cut a strip of the wood panel paper as shown. Tie a bow around the bottom portion. Step 4. Attach the tree with foam adhesives. Glue 5 sequin stars above the tree. Step 5. 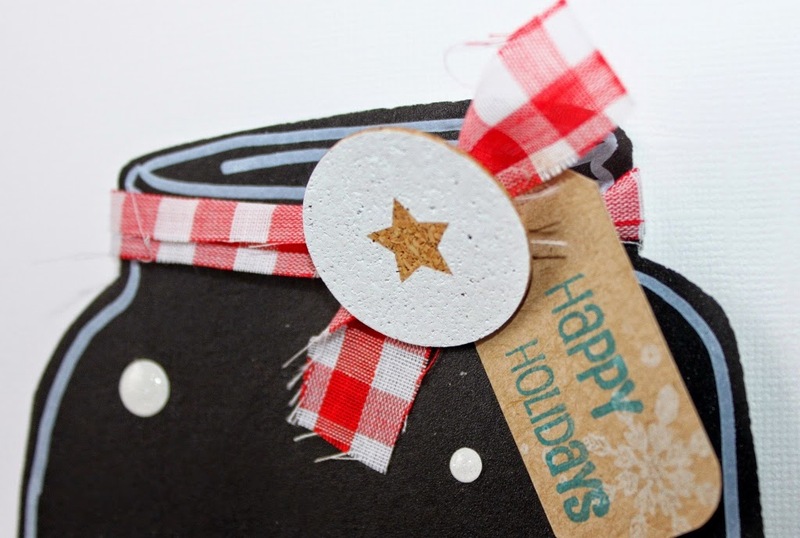 Cut a piece of the ornament paper and adhere to the right side of the card. Step 6. Stamp the sentiment on a piece of the blue cardstock. Step 7. Arrange the card as shown. Add scalloped satin on the card seams. Step 8. Glue sequins to the bottom right side as shown.